Definition at line 505 of file lldir.cpp. References llendl, llerrs, LLFile::mkdir(), S32, and LLFile::stat(). Definition at line 57 of file lldir.cpp. 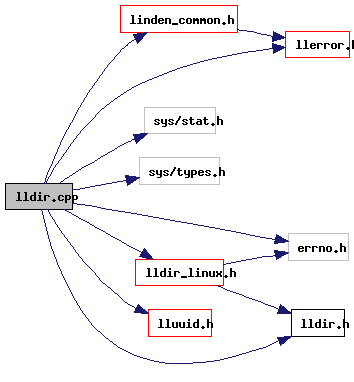 Definition at line 60 of file lldir.cpp. Referenced by another_instance_running(), LLPrefsIMImpl::apply(), LLMuteList::cache(), LLInventoryModel::cache(), cleanup_app(), LLFloaterCompileQueue::compile(), LLVoiceClient::connectorCreate(), LLViewerImageList::doPrefetchImages(), LLFrameStats::dump(), LLVOAvatar::dumpArchetypeXML(), exported_j2c_complete(), LLTexStaticImageList::getImageTGA(), LLTextureCache::getLocalFileName(), LLPolyMesh::getMesh(), LLTextureCache::getTextureFileName(), handle_reload_settings(), LLAudioEngine::hasDecodedFile(), idle_startup(), LLXMLRPCTransaction::Impl::init(), LLInventoryView::init(), init_cache(), init_logging(), init_marker_file(), init_start_screen(), LLTextureCache::initCache(), LLVOTree::initClass(), LLVOGrass::initClass(), LLVOAvatar::initClass(), LLViewerWindow::initFonts(), LLXfer_File::initializeRequest(), LLTransferSourceFile::initTransfer(), LLAssetStorage::legacyGetDataCallback(), LLFloaterImport::LLFloaterImport(), LLFloaterNameDesc::LLFloaterNameDesc(), LLPanelLogin::LLPanelLogin(), LLUrlWhiteList::load(), LLGenePool::load(), LLAudioData::load(), load_crash_behavior_setting(), load_name_cache(), load_password_from_disk(), load_region_name_cache(), load_url_local_file(), loadAttentions(), LLViewerRegion::loadCache(), LLFeatureManager::loadFeatureTables(), LLFeatureManager::loadGPUClass(), LLTexStaticImageList::loadImageRaw(), LLKeyframeMotionParam::loadMotions(), LLShaderMgr::loadShader(), LLInventoryModel::loadSkeleton(), LLViewerObject::loadTaskInvFile(), LLBVHLoader::loadTranslationTable(), LLUI::locateSkin(), login_alert_status(), main(), main_loop(), LLFloaterPreference::onBtnOK(), LLFloaterImport::onBtnOK(), LLPanelNetwork::onClickResetCache(), LLPanelNetwork::onClickSetCache(), LLScriptEdCore::onHelpComboCommit(), LLLiveLSLEditor::onSaveBytecodeComplete(), LLPreviewNotecard::onSaveComplete(), LLWearable::onSaveNewAssetComplete(), LLImageJ2C::openDSO(), LLPanelNetwork::postBuild(), LLFloaterImport::postBuild(), process_alert_core(), LLXferManager::processFileRequest(), LLMuteList::processMuteListUpdate(), LLAudioDecodeMgr::Impl::processQueue(), LLViewerObject::processTaskInv(), LLVOVolume::processUpdateMessage(), LLMuteList::processUseCachedMuteList(), purge_cache(), LLTextureCache::purgeAllTextures(), reload_personal_settings_overrides(), remove_cache_files(), remove_marker_file(), render_disconnected_background(), LLMuteList::requestFromServer(), LLStandardBumpmap::restoreGL(), LLUrlWhiteList::save(), save_crash_behavior_setting(), save_final_snapshot(), save_name_cache(), save_password_to_disk(), save_region_name_cache(), LLViewerRegion::saveCache(), LLLiveLSLEditor::saveIfNeeded(), LLPreviewLSL::saveIfNeeded(), LLViewerWindow::saveImageNumbered(), LLViewerWindow::saveMovieNumbered(), LLWearable::saveNewAsset(), LLFloaterCompileQueue::scriptArrived(), send_crash_report(), LLTextureCache::setDirNames(), LLScriptEdCore::setHelpPage(), LLUICtrlFactory::setupPaths(), LLViewerImageList::shutdown(), LLVoiceClient::stateMachine(), update_dialog_callback(), updatethreadproc(), upload_new_resource(), upload_pick(), LLLiveLSLEditor::uploadAssetLegacy(), LLPreviewLSL::uploadAssetLegacy(), viewer_crash_callback(), WinMain(), write_debug(), and LLInventoryView::~LLInventoryView().